Kathy Groob is a successful political consultant and the managing partner at November Strategies. Her firm boasts an 80% win rate with candidates and provides a host of services to candidates, PACs and organizations. Kathy founded ElectWomen in 2008 to help women learn about politics and to encourage them to become involved and to provide the tools for women to run for office. Kathy began her political career in 2000 when she was elected to the Ft. Mitchell City Council. After serving two terms, she ran against a long-term incumbent for the Kentucky Senate in 2004 and again in 2008 at the urging of Kentucky’s Governor and party officials. Election results show that Kathy lost the 2008 race by 807 votes out of over 41,000 votes, but the election results were wrapped in scandal and possible fraud that left many voters in Kentucky feeling the outcome was less than certain. 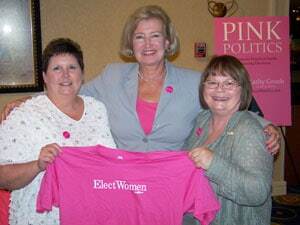 In addition to her work as a political consultant, Kathy Groob is the author of PINK POLITICS, The Woman’s Practical Guide to Winning Elections. Kathy has developed women’s initiatives in the workplace by leading and planning leadership programs. She has served as a mentor to several women in the workplace and was a finalist in the Outstanding Women of Northern Kentucky award program. Kathy has served on numerous community boards and business organizations including being elected to Ft. Mitchell City Council. She has served on the prestigious Northern Kentucky Vision 2015 steering committee and also sits on the KET Regional Fund Board. She was appointed to the Governor Steve Beshear Transition Team in 2007. As co-founder of Emerge Kentucky, Kathy served as the young organization’s founding executive director and a member of the board of directors. She also served on the board of the Kentucky Women’s Network. With offices in Washington DC and in Northern Kentucky, Kathy resides with her husband and business partner, Jeff. The couple has three adult children and a little rescue dog named Buddy.